This easy fried fish recipe uses hake or whiting, which can usually be found in abundance in Morocco. Hake is seen to be the perfect fish for frying; not only does it have great mild flavor and texture, but the bones are easy to remove after cooking, making it less tedious to eat than other fish. In Morocco, hake is referred to as merna, cola, or merluzza. Smaller whiting tends to be tastier than larger ones. Try to select fish that are 7-inch or less in length. Wash each fish, checking to be sure the stomach cavities are clean; drain thoroughly. Sprinkle the fish with about 2 teaspoons of the Moroccan Fish Spice, and a little bit of salt if desired. Alternatively, season the fish to taste with a light sprinkling of pepper and salt. When ready to fry, place the flour on a plate or shallow dish. Lightly coat the fish with the flour, shaking off the excess, and set aside in a single layer on a tray. Pour enough vegetable oil into a frying pan to fully coat the bottom, and heat for 2 to 3 minutes over medium heat. Cook the fish in batches, turning only once, until light to medium golden on both sides. Do not crowd the pan. Add a little more oil if needed. For very small whiting, the frying will only be several minutes on each side. For larger whiting, you might find it takes up to 7 to 8 minutes on each side. Transfer the fish to a plate lined with paper towels to drain. Then transfer the fish to a serving platter. Serve room temperature or warm, with lemon wedges on the side, if desired. 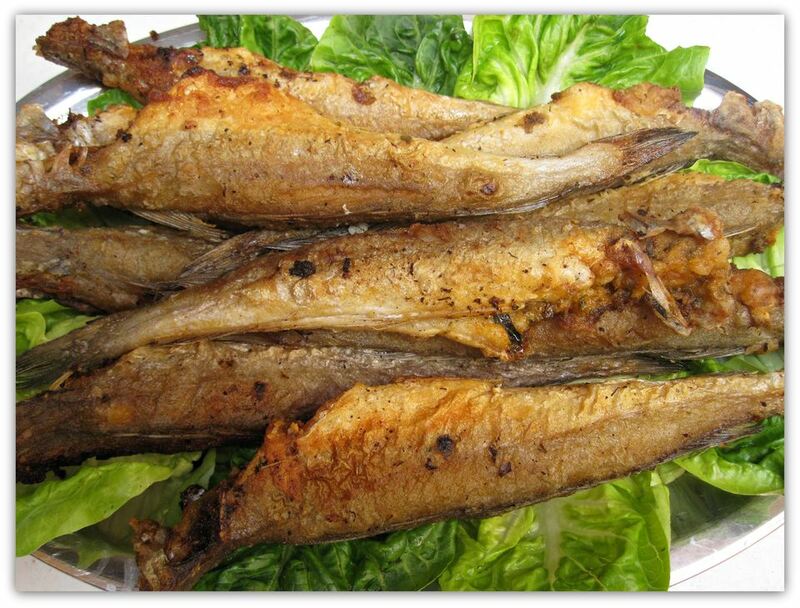 Leftover fried fish can be stored in the refrigerator and reheated the next day. Lay in a single layer on a baking sheet, and place in a preheated 350 F (180 C) for about 10 minutes. Have your fishmonger remove the heads and clean the cavities. Fish is best fried the same day as purchased, but if properly washed and drained, it will keep nicely until the next day. The whiting can be seasoned with Moroccan Fish Spice or simply salt and pepper before frying. Serve it alone or as part of a Moroccan Fried Fish Dinner.